Assembla’s system is super flexible to meet the needs of almost any team or project. In order to get the most out of your Assembla projects, here are some tips and tricks to help you and your team work smarter and faster. Add custom status workflows to match your process. You can also create new statuses and rearrange their order by going to the Tickets tool > Settings sub-tab > Status and Workflows section. The order the statuses appear on this page is the order they will appear in the status dropdown on tickets and the order of the columns from left to right on your Cardwall view. Create custom ticket fields for more detailed ticket requirements. For example, adding “Due Date” using the date custom type or “Tester” using the team list custom type. Go to the Tickets tool > Settings sub-tab > Ticket Fields section. You can create new custom fields, rearrange the order of custom ticket fields, set required custom fields, and define default values for ticket fields. When setting new custom fields, you can choose between text, numeric, list, team list, date, date/time, and checkbox options. Use Assembla’s markup language to quickly reference tickets, commits, files, embed images inline, and much more. Reference another ticket by typing in #ticket_number such as #112. Link to a file with [[file:file_name]] such as [[file:screenshot.png]]. Directly embed an image inline with [[image:file_name]] such as [[image:screenshot.png]]. You could use the markup language shortcuts by directly typing the syntax into any text area OR by using the toolbar above the text areas. Change the default view so when team members visit the Tickets tool, they immediately land on the view that is most important - List, Planner, or Cardwall. Go to the Tickets tool > Settings sub-tab > Default Views section and select the desired default view. Create an ‘Epic’ or ‘Story’ to manage tickets relationships. This ticket relationships will help you break up bigger tasks into smaller, more manageable chunks. 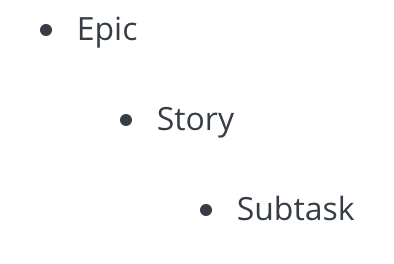 When creating a new ticket, select Epic or Story from the plan level dropdown. When you create an Epic, the left hand Related Tickets section will have a link to quickly Add new child story. When you create a new story, the left hand Related Ticketssection will have a link to quickly add new subtask. You can also add and modify relationships from any ticket via the Related Tickets subtab. Learn more about using Stories and Epics to work more efficiently. Build team filters to get the desired list of tickets for your team. Visit the Ticket List view and click on the Filter expansion menu on the top left side of your screen. Build the desired filter and click the Search button at the bottom of the panel. Once you have the desired filter built, give your filter a name, check the Share with team checkbox, and click the Save button. Now visit the Ticket Settings sub-tab > Default Views section and select the desired default list report. If your team uses time estimates, you can enable estimates and choose between different types: by total time (hours), by points, or size (small/medium/large). Go to the Tickets tool > Settings sub-tab > Ticket Fields section and select the desired estimation type from the Estimations section. You can also disable estimates from this section. Identify “stuck” tickets that have not changed status for a defined amount of time. Sometimes these tickets are either not important (can be moved to another milestone), have been forgotten about, or need some assistance. Go to the Tickets tool > Metrics sub-tab > Stuck Tickets section. Define the amount of time and see a report of “stuck” tickets. Quickly get an at-a-glance view of the status of stories in progress. Go to the Tickets tool > Metrics sub-tab > Stories Lifecycle section. Here you will see a list of all stories, the number of active tickets, a progress report, and the story owner. Click on any story to open it up and see more details. You can Import your tickets from Jira and other tools into Assembla’s Tickets tool. Go to the Tickets tool > Settings sub-tab > Export & Import section. Select the type of file you want to import and browse for your file. After selecting your file, click on the Import Tickets button.